Cork-born Duncan Hamilton was a key figure during a glorious era of motorsport and even won the iconic Le Mans race in 1953. Duncan Hamilton was a celebrated figure in 1950s motorsport and was born in Cork in 1920. 25 YEARS AGO, an obituary appeared in a number of UK newspapers. “Duncan Hamilton epitomised men who merit the description ‘larger than life’, for he was one who not only went out to meet it, but who embraced it heartily at every opportunity,” said The Independent. According to The Observer, he was ‘one of the most extrovert and devil-may-care racing drivers of the post-war era’. Hamilton was best-known for excelling in the golden age of motorsport in the 1950s and for pulling off a sensational victory in the iconic Le Mans 24-hour race in 1953 as part of the Jaguar team. But nothing appeared in the Irish press about Hamilton’s death, despite the fact that he was from Cork. Hamilton’s autobiography, Touch Wood, was originally published in 1960 and is a remarkable collection of uproarious anecdotes that shines an enthusiastic light on an effortlessly stylish and romantic era in motorsport history. He briefly discusses his formative years in Ireland, where he was born in 1920, though the descriptions are short on detail, including his parents’ names and background. But he does make a point of recounting his father’s talents as a sportsman and how he represented Ireland in golf and tennis. The family home was a converted monastery and was a target during and after the War of Independence. According to Hamilton, a friend of his father’s was shot at the front door and ‘more than once bullets splattered into the rooms’. He paints vivid pictures of the family sleeping on mattresses beneath the windows ‘to avoid the snipers’ bullets’. “He was quite a busy chap, one way or the other,” his son, Adrian, tells The42. The family moved to England when Hamilton was six and following school, he joined the Air Force when World War II broke out. In his early days learning to fly, he’d look for some final words of encouragement from his superiors. Given the tutorials were clearly focused on protecting machine more than man, Hamilton inevitably crashed and was banished. Eventually, he was enlisted in the Fleet Arm of the Navy and narrowly escaped death when his ship was bombed by the Germans. He’d been drinking onboard when the explosion hit and later, as he bobbed in the freezing Nordic waters aboard a lifeboat for 12 hours, he could do nothing else other than dissect the incident and the immediate aftermath. “This was my first real taste of war, and I remember thinking how strange it was that one man could just walk out of the bar and into a lifeboat, whereas others perished,” he later wrote. Hamilton was luckless and the vessel that rescued him and his shipmates was later blasted to smithereens by another German shell. The boat went under in 30 minutes and he was back in the water, though rescued again shortly after. But, it wasn’t long before he found himself a lot closer to an explosion and Hamilton ended up in a hospital bed for five months recovering from another German bomb attack. For the remainder of the war, Hamilton found himself immersed in genuine espionage, particularly secret missions. He returned to the skies and would rendezvous with various European-based allied agents. There were many near misses and various colleagues who perished, but Hamilton seemed to relish the adrenaline rush. Still, by the time the war ended in 1945, both of his parents were dead and he found the period to be lonely and isolating. His girlfriend, Angela, had agreed to marry him but only if he gave up flying and so he began searching for a desk job. And, instead of some tedious nine-to-five, Hamilton managed to rekindle a special relationship with cars. It was back in Cork that his father used to plant him in the passenger seat and explain the different mechanics – the steering wheel, the brakes, the gears. And it fascinated him. Later, in England, he studied at the Aeronautical College and had stripped down an old Austin Seven and rebuilt it to use himself. He started to sneak into Brooklands to watch motor racing events and would even don some overalls to pose as a mechanic and get close to the vehicles. It enabled him to continue working on cars and gain some invaluable experience. 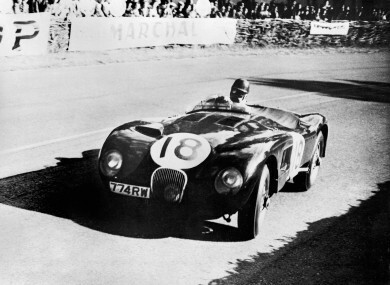 By the late-1940s, Hamilton was hill-climbing and sprinting in a Bugatti and an MG and really got a taste. Then came entering his cars in official trials and race events and he was becoming widely known on the circuit. By 1951, he was competing at the British Grand Prix at Silverstone with legendary contemporaries like Alfa Romeo’s Juan Manuel Fangio. But, in a lifetime of spectacular stories, it’s Hamilton’s incredible performance at Le Mans that stands out. “Those days – 1950s motor-racing – were just terrific,” Adrian says. Le Mans, the arduous, relentless, gruelling show of will and determination, has existed since 1923 and is an illustrious date in motorsport’s calendar. Hamilton and his co-driver Tony Rolt had entered a number of times and even finished fourth in 1951. But in 1953, it looked like they wouldn’t even get a chance to take part. The story goes that the night before the race was due to begin, the pair were drowning their sorrows in a local watering hole after being disqualified during practice. The drinking continued well into the morning until suddenly, six hours prior to the start, word filtered through that Jaguar had paid a fine to the organisers and the duo were back in the race. A few pots of coffee (and some hair of the dog) later and the boys were unwittingly on their way to an inexplicable victory. Of course – paraphrasing John Ford – when there’s a choice between the legend and the truth, always print the legend. “To be absolutely honest, the story is wrong,” Adrian clarifies. Three world driving champions entered, including Fangio (Alfa Romeo), Alberto Ascari and Giuseppe Farina (both Ferrari) but none of them even finished. Hamilton and Rolt finished ahead of another Jaguar, driven by Stirling Moss and Peter Walker. “1953 was a pretty momentous year for everybody in England,” Adrian says. Then, he recounts his memories of a rather unique surgical procedure. Hamilton asked for water but was told it was contaminated so port would have to do. Then, the doctor began to go to work, effectively in darkness. Hamilton managed to return to Le Mans the following year where he and Rolt narrowly finished second to Ferrari. They were within two miles of victory after Hamilton excelled following a deluge, something he was particularly adept at. But, in the dry, the Jaguar D-type just couldn’t make up the time. It was a dangerous time for motor racing and the 1955 Le Mans event remains the most devastating incident in the history of the sport. Pierre Levegh collided with Lance Macklin and was killed instantly. Pieces of debris flew into the crowd and 83 spectators lots their lives that day. After a heavy shunt at the Le Mans race in 1958 and the death of his close friend Mike Hawthorn (who had been heavily involved in the ’55 incident) the following year, Hamilton stepped away from racing at the end of the decade. He did remain involved in motorsport until retirement in the early 1970s and Adrian is now in charge of the family car business. “They were terrific years, they were iron men, they got on with the job and they had a lot of fun doing it at the same time,” Adrian says. Email “Espionage, glory and an Irish past: the absorbing, thrilling but forgotten tale of a sporting legend”. Feedback on “Espionage, glory and an Irish past: the absorbing, thrilling but forgotten tale of a sporting legend”.